Promote Control Bulb Ramping and Bulb HDR Assistant Kit for stunning time-lapse sequences. Promote Control Bulb Ramping and Bulb HDR Assistant Kit. We recommend users wishing to enter the world of 'Bulb Ramping' watch this video (twice!) and read all the instructions. It may seem tricky at first, but once you get the hang of this, and the 'advanced' options - the results can be stunning. Bulb HDR for extended High Dynamic Range bracketing with cameras that do not support Promote Control regular USB bracketing – such as legacy Canon EOS cameras. The Assistant Kit requires using a shutter cable that is compatible with your camera. It helps Promote Control to precisely control exposure times when your camera is in Bulb mode. Please also make sure your Promote Control is updated to firmware version 2.30 or higher. Using the Assistant Kit is very easy. Simply connect your shutter cable to the Promote Control shutter cable port, and then to your camera’s shutter release port. Then connect the Bulb Assistant cable to your camera flash synchronization port. 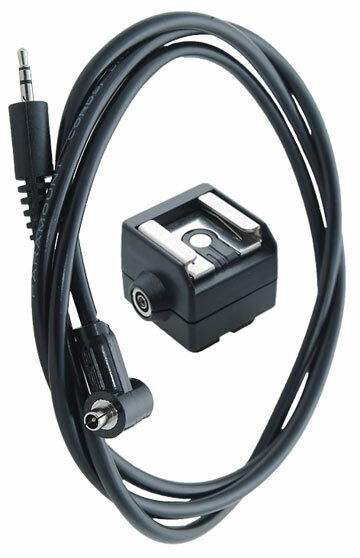 If your camera does not have a flash synchronization port, use Bulb Assistant flash hot shoe adapter to connect your Bulb Assistant cable. The other end of the Bulb Assistant cable is connected to your Promote Control remote sensor port. With the Bulb Assistant cable, USB cable is not required and may be disconnected. Once all cables are connected, turn on your Promote Control and your camera. Make sure to put your camera into manual focus mode, and enable Bulb exposure. Consult your camera user manual for more details. Before we begin taking pictures, we need to calibrate our new system. Press Left and Right keys on your Promote Control to enter the Setup menu. Scroll to the “Shutter close delay” setting. Make sure your camera is on, has a memory card in it, and both shutter and Bulb Assistant cables are connected. With the "Shutter close delay" setting displayed, press “Up” on your Promote Control to start calibration. The camera will take three test pictures and calculate parameters required for precise Bulb exposure timing. Now you are ready to take pictures! Let’s start with Bulb HDR. Just like a regular HDR bracketing done with Promote Control via USB port of the camera, the Bulb HDR provides extended bracketing options for capturing wide contrast scenery. However, Bulb HDR does not use USB – it only uses shutter cable and the Bulb Assistant cable. This allows using taking HDR bracketing sequences with cameras that are not supported over USB. Due to the technical limitations of the Bulb port, the fastest exposure that can be securely timed is 1/20 seconds. When a programmed Bulb HDR sequence falls out of the attainable range, the Promote Control will display an “Invalid Settings” message. If you plan on taking HDR images in broad daylight, you may need to use Neutral Density filters in order to fit within the exposure limitations. With your camera in manual focus and in Bulb exposure mode, set up your Promote Control the same way you would set up a regular High Dynamic Range sequence, but minding the above 1/20 second limitation. Your Mid Exposure would be equal to an exposure your camera meter considers normal for the scene. You can begin with a step of 1.0EV, and 5 or 7 total exposures. Click Start, and have your new HDR sequence taken automatically. Now let’s talk about Bulb Ramping. This technique is useful when you want to take images of a sunset or other conditions with smoothly changing light, and need to vary your exposures in very small increments. The resulting images are merged into a Time-Lapse video that has a smooth transition from day to night. This can only be done via Bulb mode with a help of the Bulb Assistant kit. The Promote Control Bulb Ramping / Bulb HDR Assistant Kit helps create high precision bulb Time-Lapse sequences, ensuring accuracy of up to 0.001 EV steps. Now you can create stunning time-lapse sequences of sunsets or other variable light conditions. In addition, this Kit enables Bulb HDR on select cameras (please see compatibility information). * NOTE 1: This Kit cannot be used without a camera-specific shutter cable. Please also choose a shutter cable that matches your camera model. * NOTE 2: This Kit assumes manual pre-entry of the start exposure for Bulb Ramping and Bulb HDR, and cannot automatically measure ambient light. Please read below for usage instructions. This Kit is compatible with all cameras supported by the Promote Control. Using this cable also requires a camera specific shutter cable - see above. Promote Control firmware version 2.30 or higher is also required. With your camera in manual focus and in Bulb exposure mode, set up your Promote Control. The Bulb Ramping mode works by steadily increasing or decreasing the Bulb exposure to predictively match steadily changing light. First, let’s determine the start exposure speed by taking a few trial pictures with your camera, and seeing which one would be right. Note that Bulb Ramping limits fastest shutter speed to 0.05 seconds, which is equivalent to 1/20 of a second. You will need to disconnect the Bulb Assistant cable from your camera to make sure it does not interfere with your test pictures. The easiest way to obtain a start exposure is to simply point your camera to the scene you want photographed, and set to the Aperture Priority mode. Set your aperture as desired, while making sure that the result exposure speed is not faster than 1/20 of a second. If you cannot obtain an exposure that is slow enough, you may need to use a Neutral Density filter. It is recommended to start with 1/5 of a second or slower to ensure optimal precision. The start exposure is the first parameter in the “B” line, and this is where you enter your exposure obtained from the camera meter. Note that the Promote Control uses decimal notation, in which 1/20 of a second equals 0.05s, 1/10 of a second is 0.10s, 1/2 of a second is 0.5s, and so on. The next parameter determines how fast Promote Control will change your exposure. It shows how many EV steps the exposure speed will be changed over a certain period (default is 10 minutes). Sunsets and sunrises are best photographed with +2.00EV or -2.00EV per 10 minutes respectively. Next setting is interval – it determines how often the camera shutter will start taking a picture. You can begin with having the default interval of 6 seconds. The interval can also be ramped up or down to increase or decrease your Time-Lapse movie. For starters, leave the interval ramping at the default of 0. The final setting is number of frames to take. If you plan on creating a 25 frames per second movie, the default setting of 200 frames will result in 8 second movie. As you change your settings, the Promote Control displays how long your sequence will take to be completed based on the current settings. Sometimes Promote Control will determine that your sequence cannot be completed – such as if your exposure speed ramps up and becomes longer than the interval between exposures. In that case it will display an “Interval Collision” message. If you click Start, Promote Control will offer details on why this sequence may not be completed. Once everything is setup, set your camera back to the Bulb exposure mode, and reconnect the Bulb Assistant Cable. Press Start on your Promote Control and watch your Bulb Ramped images show up on your camera memory card!